We associate Ernest Hemingway with foreign locales: Spain, Italy, Paris, Africa and Cuba. He may be the definitive peripatetic writer, famously hauling his manuscripts-in-progress around the world while soaking in enough material for the next book. 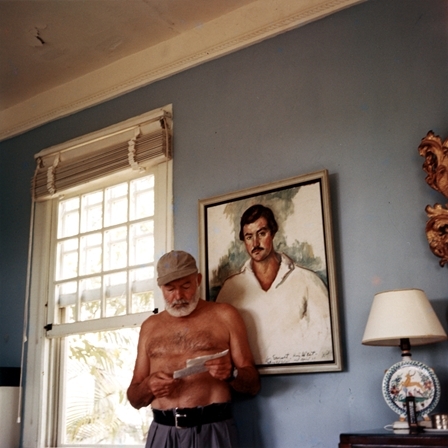 Lucky for us Hemingway may also be one of the most photographed writers of his generation. The photographs in the Ernest Hemingway Collection take us into a mid-century world where writers, actors, political leaders and beautiful jet-setters mingled on patios and yachts at ease before the camera. These were the days before paparazzi started hiding in bushes. The collection is available to us with a typical Hermingway-esque story attached. When he died in 1961 in Idaho, most of his personal effects were still in Cuba. Heminway lived for 20 years in the Finca Vigia, a home he bought with the royalties from For Whom the Bell Tolls. It was at Finca Vigia that he wrote The Old Man and the Sea. Rather than writing in the workshop that his wife Mary had built for him there, he used the bedroom, leaving the new room for his numerous pet cats to use. At the time of his death, American travel into Cuba was banned. However President Kennedy made special arrangements for Hemingway’s widow Mary to return to Finca Vigia and retrieve his personal belongings. Years later, the John F. Kennedy Presidential Library and Museum received the materials, including more than 10,000 photographs, books from Hemingway’s private library (including A Draft of XVI Cantos signed by Ezra Pound) and the hand-written sailing log Hemingway kept of his travels aboard Pilar. The photographs are now organized chronologically and geographically: Early Years 1899-21; Paris Years 1922-1930; Wars 1917-1945; Key West Years 1928-1939; Idaho Years 1939-1960; Africa 1933-1934 and Africa 1953-1954; Europe 1948-1959; Cuba Years 1939-1960; and Spain 1953-1960. 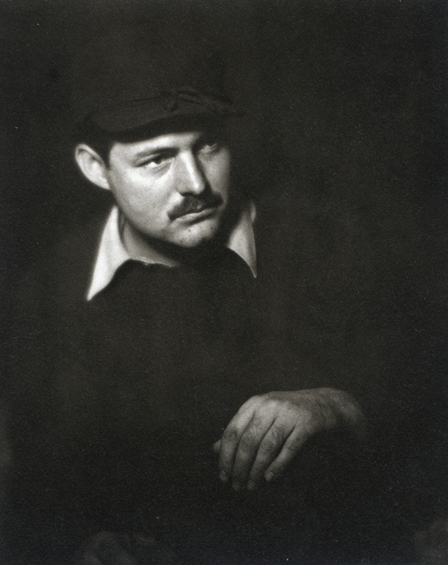 Hemingway was in Paris when he sat for this portrait in March, 1928. The photographer, Helen Pierce Breaker, was a friend and had been a bridesmaid in Hemingway’s wedding to his first wife, Hadley. 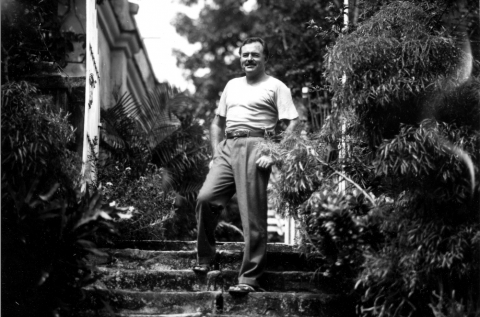 By the early 1950s, Hemingway was living in Cuba. The painting behind him here at Finca Vigia is a portrait of himself by Waldo Peirce titled Kid Balzac. Kate Rix is an Oakland-based freelance writer. Find more of her work at . The links are no good.